The Kobold Press community is an intelligent, creative, dedicated, enthusiastic, and fierce group of people, and we at the parent company, Kobold Press, appreciate and value the contributions of our community members. This Community Use Policy is designed to encourage you to spread your enthusiasm and creativity while respecting ownership of our copyrights, trademarks, and other intellectual properties. This policy authorizes certain non-commercial use of the Kobold-Press-related material specifically identified in the Permissions section of this policy (“Kobold Press Material”). This [website, character sheet, or whatever it is] uses trademarks and/or copyrights owned by Kobold Press and Open Design, which are used under the Kobold Press Community Use Policy. We are expressly prohibited from charging you to use or access this content. This [website, character sheet, or whatever it is] is not published, endorsed, or specifically approved by Kobold Press. For more information about this Community Use Policy, please visit koboldpress.com/k/forum in the Kobold Press topic. For more information about Kobold Press products, please visit koboldpress.com. By using content under this Policy, you agree to not use any material in a way that suggests Kobold Press endorses or is in any way responsible for anything you create, or that suggests that you have any other relationship with Kobold Press, unless we have a separate written agreement that lets you do so. You agree to not use Kobold Press trade dress—that is, you may not make your material look like ours. You agree that such use could irreparably harm Kobold Press. You agree to use your best efforts to preserve the high standard of our intellectual property. You agree to present Kobold Press, our products, and the Kobold Press Material in a generally positive light. You agree to not use this permission for material that the general public would classify as “adult content,” offensive, or inappropriate for minors, and you agree that such use would irreparably harm Kobold Press. You agree to not do anything illegal in or with products or websites produced under this Policy. You agree to create an account on koboldpress.com and add an entry describing your material on our Community Use Registry at koboldpress.com/k/forum/, with links where appropriate. You agree to endeavor to keep this information up-to-date. You may use the contents of the Community Use Package at http://koboldpress.com/kpstore/product/community-use-package-1-iconic-characters/. 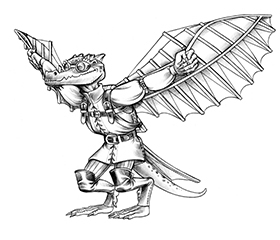 You may use only those versions of the Kobold Press Materials from the Community Use Package. You may not alter the color, typography, design, or proportions of the logos or icons, or otherwise modify them. Should an item be removed from the Community Use Package, you don’t need to remove it from existing projects, but you may not use it in future projects. You may use the cover images, as displayed on koboldpress.com, of all of the products on our Community Use Approved Product List below. Product covers may not be cropped, color adjusted, edited, distorted, or modified. You may use the textual product descriptions, as they appear on the back of each product or in the product listings on koboldpress.com, of all of the products on our Community Use Approved Product List below. You may use any of the text or artwork published in the Kobold Blog at koboldpress.com, with the exception of any logos and icons that aren’t also in the Community Use Package and any text that includes rules or mechanics covered by the Pathfinder Compatibility License. You may not use any of the Midgard Icons, Your Whispering Homunculus, Real Steel, Howling Tower, or Trapsmith entries in the blog. You may not use any photographs published in the blog (because those rights are usually not ours to offer). You may not use artwork, including maps, that have not been published in the blog, although you may create your own interpretations of material presented in our artwork and maps, provided that your interpretations don’t look substantially similar to our materials. You may descriptively reference trademarks, proper names (characters, deities, artifacts, places, etc. ), locations and characters from products listed in Section A of our Community Use Approved Product List below, provided it is clear that these are our marks. You may descriptively reference dialogue, plots, storylines, language, and incidents from products listed in Section A of our Community Use Approved Product List in campaign journals and play-by-post or play-by-email games. Pathfinder is a registered trademark of Paizo Publishing, LLC, and the Pathfinder Roleplaying Game and the Pathfinder Roleplaying Game Compatibility Logo are trademarks of Paizo Publishing, LLC, and are used in some Kobold Press products under the Pathfinder Roleplaying Game Compatibility License. The Kobold Press Community Use Policy does not extend use of these trademarks to the Kobold Press community. See http://paizo.com/pathfinderRPG/compatibility for more information on the Pathfinder Roleplaying Game Compatibility License, and see http://paizo.com/communityuse for Paizo Publishing’s own Community Use Policy. This policy in no way alters Open Design’s ownership of any of our intellectual property and we reserve the right to amend, modify or terminate this Policy at any time. We will post revisions to this Policy on our website, so check back frequently to make sure you have the most current version.